Ao Lua Ha Dong (Ha Dong Silk Dress), directed by Luu Huynh, has qualified for the official round of the 11th Busan International Film Festival to be taken place in the southern South Korean city of Busan. Actress Truong Ngoc Anh in "Ao Lua Ha Dong"
Ao Lua Ha Dong co-produced by the Phuoc Sang Studio, Viet Studio and Anh Viet Co starring artists of Truong Ngoc Anh, Quoc Khanh, Kim Thu, Ha Kieu Anh, Tong Bach Thuy was invested in about US$1 million. Its premiere will take place on the National Women Day, March 8, 2007. 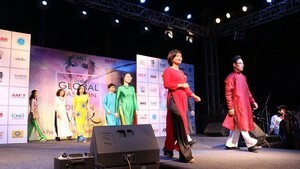 The film tells about the destinies of women in generations of a family attached to an Ao dai (Vietnamese traditional silk dress) and their attempt to hold on to a precious Ha Dong silk dress. It also transitted images of Vietnamese people and the beauty of Ao dai to the audience. The annual Busan International Film Festival is one of the most significant film festivals in Asia. The festival offers a look at the prospects of Asian films and their trends. More than 350 films have been entered in this year’s Busan filmfest, which will runs from October 12-20. Reportedly, the Viet Nam Cinema Department sent two films of Ao Lua Ha Dong and Chuyen Cua Pao (Pao’s story), directed by Ngo Quang Hai to the festival.